Lately the Apple Watch grabs most of the headlines for an all-around high tech watch, but for serious fitness enthusiasts there are better choices. The Garmin Fenix 5X Plus (Buy on Amazon) is a multisport GPS watch. And we think it’s the best GPS watch. Outdoor navigation via Global Positioning System (GPS) sensors. Optional wrist-based Pulse Ox Acclimation sensor (blood oxygen saturation levels – which is great for altitude training). 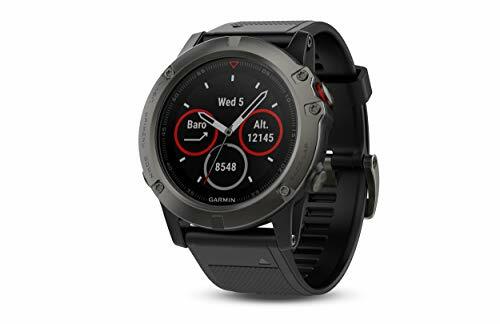 It’s also got a list of high tech features that should satisfy any gadget guru: Garmin Pay (a contactless payment solution – so you can leave your wallet at home), customizable watch faces, ANT+ connectivity for heart rate displays, Bluetooth connectivity (for headphones) and pairing with your phone for text messages, and more. How fantastic? How about as many as 20 days in smartwatch mode between charging, or 13 hours when using GPS position tracking and music playback? Why is sapphire used for watch crystals? Sapphire (uncolored synthetic corundum) is a clear, scratch proof synthetic crystal. It is very scratch resistant. The crystal of a watch — the clear cover that goes over the dial and protects it – needs to be tough, especially for a sports watch. If you are going to buy an expensive watch – make sure it’s highly scratch resistant. Therefore we recommend the Sapphire model of the Fenix 5X. Consider also this is an active sports watch, not a dress watch for going out for a night on the town. The Fenix 5X features multi-network satellite reception to track in more challenging environments than GPS alone. This means it can use the Global Positioning System (GPS) of the US, the Galileo system of the EU, and the GLONASS system of satellites in use by Russia. With more points of contact from the satellites the users’s position can be calculated more accurately. Shown here is an example of the “ABC” (Altimeter, Barometer, and Compass) display. The watch features an altimeter (for determining elevation or height above sea level), a barometer (for measuring atmospheric pressure), and a compass. Having the altimeter is a must-have feature for those hiking in the mountains. This allows the watch to accurately track ascent and descent and elevation changes overall. The compass is a tilt-compensated three-axis electronic compass. This will help keep an accurate bearing — whether the user is moving or still. Here’s the ClimbPro display – with real-time information on current and upcoming climbs. The gradient (as a percentage), distance, and elevation gain are all shown. An optional feature that might help climbers and hikers is the Pulse Ox Acclimation sensor. This sensor uses light beams (from the back of the watch) to gauge the absorption of hemoglobin in your bloodstream. This will tell you how well your body’s oxygen levels are adjusting to the thinner air of high altitude. For fitness tracking there are additional sensors – a Gyroscope, Accelerometer, and Thermometer. Heart rate training is an important concept in modern fitness. You can tailor the results of your training based on what you want to improve – for instance to improve your VO2 Max or maximize fat loss. 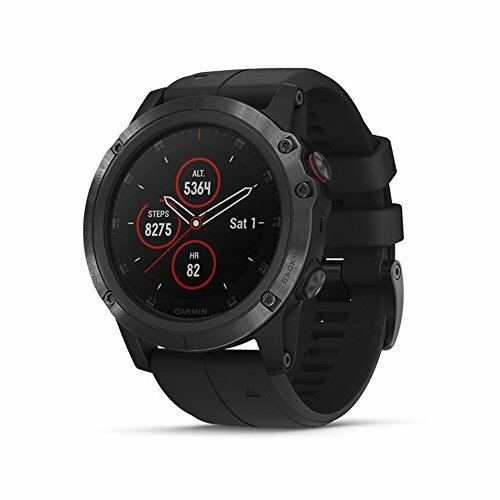 The Garmin Fenix 5X Plus uses wrist based heart rate tracking. This means no bulky and hard to use chest strap. Versions of the watch with HRM-Tri and HRM-Swim can even measure your heart rate while swimming! With storage space for 500 songs, you’re going to want to pair up with a good set of fitness wireless headphones. Why? An excellent product with great features and a limited lifetime warranty. 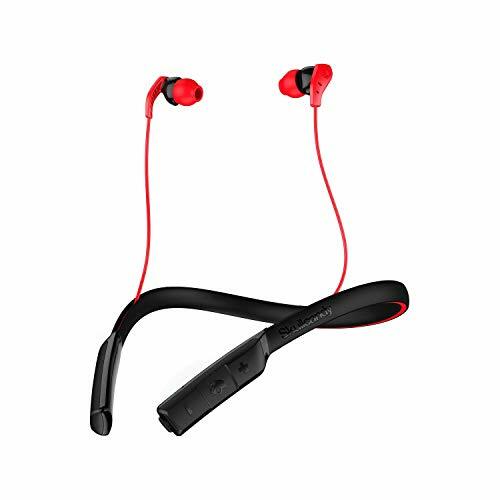 This model in particular is sweat resistant, 9-hour battery life, and provides great sound. IN EAR COMFORT: Advanced DualLock technology and flexible around-the-neck collar keep the earbuds in place even during long, intense workouts. SWEAT RESISTANT: Secure, water-resistant construction with advanced materials keeps your earbuds safe from perspiration and moisture while you exercise. MICROPHONE INCLUDED: Never miss a call while working out; connects to your phone via Bluetooth. LONG BATTERY LIFE: A 9-hour rechargeable battery keeps the music going for your workout and throughout the day. Plus, the battery fully recharges in just 2.5 hours. EASY TO OPERATE CONTROLS: Built-in remote on the collar includes call, track, and volume controls. The Fenix 5X Plus is a good looking watch. But you can make it even better looking by customizing the watch faces you use. The Garmin Apps store has over 25 different watch faces for the Garmin Fenix 5X. For a fitness watch with GPS and biometrics there are many alternatives to the Apple Watch. The Garmin Fenix 5X Plus is the best model available for fitness enthusiasts desiring premium features. The watch looks good, is durable, and has excellent battery life considering the list of features. Some product photos are property of Garmin Ltd. and provided by Garmin Ltd.
Topicsalternatives to apple watch for sportsapple vs garminapple watch alternativesapple watch vs garmin fenix 5x plusbest gps watchbest gps watch with altimeterbest multisport gps watchBest sapphire watchbest wrist gpsbetter than apple watchfenix 5 multisport gps watchGarim ClimbProGarminGarmin Fenix 5X PlusGarmin Fenix 5X Plus for saleGarmin Fenix 5X Plus on salegarmin fenix 5x watch facesGPS Watchgps watch for navigationgps watch garminMultisport GPS watchmultisport watchWhat is a multisport watch?Where to buy the Garmin Fenix 5xWhy is sapphire used in watches? I'm an all around computer junkie, interested in many aspects of programming, operating systems, and enterprise IT technologies. I love Mac OS X, Linux, and Windows and I'm not particularly militant about any one over the other. Need a robust off the grid power solution? Check out the Goal Zero Yeti line of power solutions - powerful Li-Ion batteries that you can charge from Solar Panels or via wall charger. These are the ultimate in portable electric power!